and the (quite false) assumption that historical swords are all fairly clean lines and such where the reality is that there are many swords that are just as gaudy even if those are somewhat impractical for battle. I think that the equation gaudy = impractical is also largely inaccurate, even though it's still popular with many archaeologists. Of course, some gaudy swords are less likely to have been used then others, but even those smallswords are still very deadly. Wow, I can honestly say I wouldn't own a sword in this entire thread. :P I don't think I've ever seen a collection of uglier swords. This is of course only my opinion, and fortunately we don't all think the same way. Variety is the spice of life and those are some pretty spicy blades. What's more, I think it would be right at home in the "fantasy" setting. I immagine Aragorn (did I spell that correctly for the LoTR fans?) would have been thrilled to use a sword like the Crecy (with a little elven magic of course). Edited to add: I do understand the point of the thread. I agree that these real-life swords posted here are every bit as "fantastic" as modern fantasy swords. I'm simply saying that I agree with J.D. Craford's tastes in regards to what is attractive in a sword. 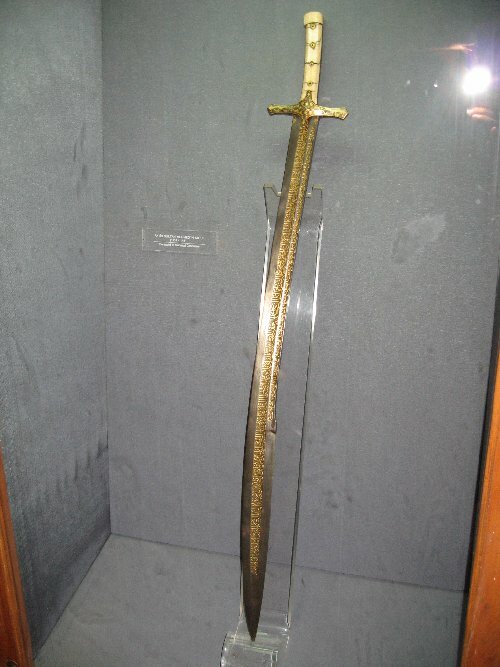 the sword of strider would i think look VERY comfortable in a museum mostly BECAUSE its based off historical blade shapes, the 'scent stopper' pommel and upturned guard and, what LOOKS like a 14th centry sword sort of, i cant identify the exaqct oakeshott type but you get what i mean. you guys know more than me and i can guess with near certqint that ive missed some glaring detail which makes the sword of strider stand out from historical replicas. but one thing has struck me about these overornamented historical blades and same for the ones in fantast works, the jewelled ones are always for very rich people. even in lotr and warhammer and warcraft there is still a MULTITUDE of simpler blades for the common soldier. Just for the record, I'm pretty much the other way around: I love a bit of bling in a sword and find it rather boring when they don't go for at least a little bit of unessecary decoration. Maybe it's all the popular culture I've grown up with, your movies and video games and so on, but I like swords that try to be a bit more then just tools for warfare - "deadly treasures", so to speak. Granted, you can go too far in either direction - some of the more decorated swords in this thread strike me as rather hideous. There's an interesting dichotomy among we modern types. It seems very few people want to reenact or recreate low-class personas (who wants to be a peasant?). Most males into this hobby recreate at least a man-at-arms persona, which in period would have required some money to achieve. Many go for knightly personas and even noble ones, which presumes an even higher level of income and status. But then many folks turn around and often arm themselves with pretty workaday weapons. So many people don't seem to mind the trappings of higher status, with brass-bordered up-to-date armor, and/or surcoats (not everyone had the rights to bear armorial charges), but still prefer weapons that might seem below their status in some cases. In period, if you could have afforded a fashionable harness and all the trappings on your rank, you could afford a little gilding here and there. There are obviously levels of bling in between many of the examples here and plain, unadorned weapons. But we often see weapons that look plain when compared to the rest of a person's kit. I see your point Chad, but I also think there's room for different interpretations to suit these different tastes. For example, an upper class knight might have their ornamental sword for court and a plain warsword for the real deal, n'est pas? I only 'suit up' up one day a year (Halloween) and don't really have a medieval personna, but if I did it would be either a highland/island Scottish nobleman or a knight of the holy orders, both of which would fit with a modest kit all around. This is not to dispute Nathan's original point - that ornamental does not necessarily equal fantasy - that's pretty clear. Sure, but some like to declare the fancy stuff as being ornamental/for parade, which doesn't mesh with the battle damage seen on some (not all) of these. 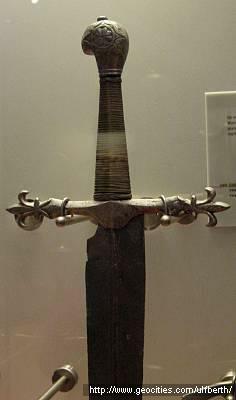 There were certainly both fancy and plain swords used by the wealthy in battle. In modern kits, though, we seem to see much more of the latter and much less of the former. Some folks go all-out with the fanciness of most of their kit, but choose a plain sword. I'd love to see more people match the sword to bling-level of the rest of the kit. Okay, that totally looks like a Weta Workshop fantasy movie prop, right there. Granted, its apparently 19th century pretending to be 16th century, but still. i forget the oakeshott number, but the albion dane at least represents that oakeshott catagory, and if weta didnt base the sword of the witchking off that type i would be surprised. and by the way, i realise were talking about WEAPONS mostly but when it comes to grossely over the top gaudy armour and helmets particularly helmets.. the japanese are there to top everyone. date masaune, had a very long, off centre metal crescent. kate kiyomasa had a gigantic eboshi shape on his. another example of later period armour had a pair of cows horns. there are also endless examples of ones covered with fur, with a bears head shape. and from what i understand they actually rode around the battlefield with these on even the reletively subdued ornaments like those bronze horn like ornaments, are still alot more gaudy than the european helmets (there are exceptions of course. Other than surviving examples, I notice a lot of 13th-14th century effigies show swords and scabbards that are much more decorated than modern reproductions. These are usually done in a style that I find more tasteful than many of the swords in this thread. And considering the date, they were probably combat swords.